For any Blackberry fans, the announcement of the Blackberry Bold 9900 at Blackberry World this morning in Orlando will hardly come as a surprise. The Bold 9900 has been discussed quite a bit in recent months and even made a cameo appearance on Blackberry’s website accidentally a few day early. As Blackberry does so well with their devices the Bold 9900 will have a GSM variant that will support UMTS bands 1,4 and 8 which means we could very well see this land on T-Mobile shelves sometime this summer. The Bold 9900 comes with a 1.2 GHz Snapdragon processor, 2.8″ touchscreen, 5 megapixel camera, 8 GB of internal storage (microSD expandable) and NFC circuitry. 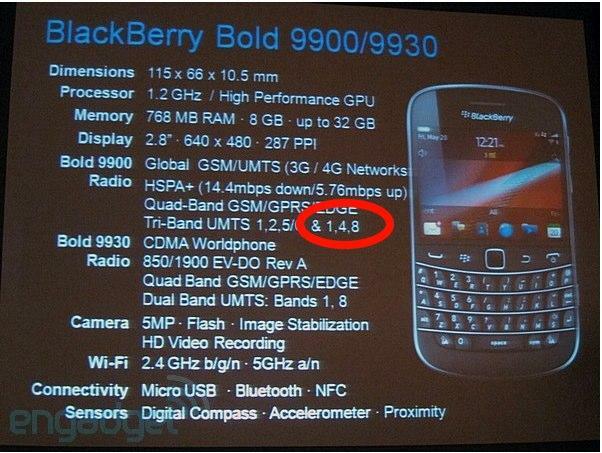 Of course, we’d be remiss to mention (and if you missed the pic above) the Bold 9900 comes complete with a full QWERTY keyboard, of which Blackberry does so very very well. Now what about the Blackberry Monza? Waterloo, ON – Research In Motion (RIM) (NASDAQ: RIMM; TSX: RIM) today unveiled two new BlackBerry® Bold™ smartphones. The high-performance BlackBerry Bold 9900 and 9930 smartphones feature a stunning and iconic design that integrates an incredibly easy-to-use BlackBerry keyboard with a brilliant, high resolution, capacitive touch screen. These exceptional smartphones are built on a new, performance-driven platform powered by the BlackBerry® 7 operating system and designed to deliver the ultimate in communications, multimedia and productivity for users around the world. Thin, Sleek, Iconic Design Distinguished by an iconic design and the industry’s best keyboard, the BlackBerry Bold 9900 and 9930 smartphones feature the premium materials and finishes that characterize the BlackBerry Bold line. Both models have a lustrous exterior with a brushed stainless steel frame and a high-gloss glass-weave backplate. They are also the thinnest BlackBerry smartphones yet, at only 10.5mm. The quality materials and optimized design of the new BlackBerry Bold smartphones are instantly evident when held in the hand. Performance-Driven These BlackBerry Bold smartphones are built on a new performance-driven platform featuring a 1.2 GHz processor, Liquid Graphics™ touch screen, and support for high speed 4G/HSPA+ wide area wireless networks. The Liquid Graphics touch screen, a key new feature powered by BlackBerry 7, delivers fast, smooth performance for highly responsive touch-based navigation, web browsing, pictures, video and graphics intensive games*. Offering up to 60 frames-per-second performance with instant UI action/response, Liquid Graphics gives customers a visually rich and immersive experience that’s responsive to the touch. In addition, the smartphones feature brilliant displays with an eye-popping 287 dpi to deliver crisp, stunning visuals. The new platform also provides support for 4G networks; the 9900 supports HSPA+ connectivity, and the 9930 supports CDMA EV-DO Rev. A and HSPA+ global roaming on GSM/UMTS networks. NFC The BlackBerry Bold 9900 and 9930 smartphones include built-in support for NFC (Near Field Communications), a new technology that will enable many rich and exciting experiences. Through NFC, users will be able to, for example, pair the BlackBerry Bold to an accessory or read information such as a web link from smart tags by simply tapping their BlackBerry Bold to an NFC tag (eg. Smart Poster). Augmented Reality The BlackBerry Bold 9900 and 9930 smartphones feature a built-in compass (magnetometer) to support location-based services and augmented reality. APIs will allow third party developers to take advantage of the new functionality within their applications. The new smartphones will also include Wikitude, the leader in mobile augmented reality, which overlays contextual information on what the user sees through the smartphone’s camera viewfinder. HD Video The new BlackBerry Bold 9900 and 9930 smartphones support up to 720p HD video recording and playback. Users can easily share their videos directly from the smartphone or sync videos, as well as music and photos, to their computer using Media Sync in the BlackBerry® Desktop Software. BlackBerry 7 The BlackBerry 7 OS is designed to power the new performance-driven BlackBerry Bold platform. It provides an easier and faster user experience with improved browsing, voice-activated searches, the ability to manage personal content separately from corporate content, as well as additional personal and productivity apps out of the box. Building upon the Universal Search feature introduced in BlackBerry 6, BlackBerry 7 expands the capability to include voice-activated search. This new capability makes it even easier and more convenient to search for content on the smartphone or web. BlackBerry 7 also integrates BlackBerry® Balance™, which separates personal content from corporate content on the smartphone, giving users the freedom and flexibility to use the handset for personal email, Facebook®, Twitter®, multimedia, games and other apps while satisfying the very real need for corporate data to be highly secure and manageable. BlackBerry Balance works in conjunction with BlackBerry® Enterprise Server 5.0.3, which provides a number of unique IT policy controls such as wiping only corporate data from the handset or blocking work related content and apps from being copied or forwarded to personal contacts. With BlackBerry 7 on the BlackBerry Bold 9900 and 9930 smartphones, users will also get the full version of Docs To Go® with all “premium” features enabled out-of-the-box so that users can easily work with Word, Excel and PowerPoint files directly on the smartphone. Docs To Go also includes a native PDF viewer. Availability The new BlackBerry Bold 9900 and 9930 smartphones are expected to be available from carriers around the world beginning this summer. * Features OpenGL 2.0 support for developers. YAWN!.. same phone, every year with slight spec bumps. except the iphone is a real smartphone. blackberry?.. not so much. This is one of the most ignorant arguments of all time. BlackBerry and iOS each have their own respective strengths and weaknesses. To say BlackBerry is not a smartphone is just juvenile. iPhone’s are the best multimedia devices while BB’s are the best business and messaging devices. Both are great smartphones, but it’s like comparing apples to oranges. Yet, some businesses are trading in their BB’s for iphones and androids. this “bb is good for business” argument is getting old. iphones/androids are just as good at messaging and email as BB is. its all about personal preference. You’re really starting to sound like you don’t know what you’re talking about. For one, I’m not partial to any particular OS, I’ve had them all. However, for the power email user, BlackBerry provides a superior experience. It’s just like saying “I can go 125 mph in my Ford Taurus.” While this might be true, that’s not what the car was designed for. Just like a Maserati wasn’t designed for rough terrain. So while you can use corporate email on an Android phone or iOS, they don’t compare to BIS or BES support by BlackBerry. The only close thing right now is the push email Google provides for gmail accounts through Android. i know what i’m talkin about. i’ve owned a blackberry and currently own an android phone. (i’m not a fan of either). the blackberry email experience isn’t that great. so, you can cling to your ‘corporate email’ argument for dear life but to an EVERYDAY user BES won’t matter. for everyday use email on my android has been a far better experience on my android. basically blackberry is dumb phone with email. This is going to be my last response because I don’t have time to keep arguing over the facts. I’ve been working in/around cell phones for over 5 years so when you make statements that “iphones/androids are just as good at messaging and email as BB is” it makes you sound like you have no clue of what you’re talking about. I agree that the iPhone is better for web browsing, gaming, and media, but those things are not what smartphones are all about. You contradicted yourself when you said for everyday users BES won’t matter, well what about those who aren’t everyday users? That statement proves that iphones/androids are not just as good at messaging and email as BB. There’s a reason why there is 100% penetration for BB’s in the military and banking industries. There’s a reason you won’t see Obama with an iphone. BB security is second to none. Furthermore, some people don’t like waiting for their emails to load when they press the mail icon on their phone (or having a limit on the amount of messages their device can download). Some people don’t like Steve Jobs telling them that Adobe Flash isn’t important. Some people don’t like the lack of customization (a basic smartphone feature that iphones don’t have). Some people don’t like having to charge their phone twice a day. Some people don’t like the crappy iOS notification system that interrupts everything you do. Again, I can see positives and negatives for each OS, and BB’s definitely have their shortcomings, but saying that BB’s are not smartphones is ludicrous. There’s no one smartphone that fits everyone’s needs, but I’m sick of fanboys not being realistic. BB has always supported true multitasking, cut/paste, customization, great battery life, etc so let’s be careful about what we’re classifying as not being a real smartphone. you hit the nail right on the head. im a network admin and have been working with BBs for a long time also (just over 4 years). security is second to none. Do you know anything about security and why Blackberry is more secure? And why do you care so much? Are you a shareholder in Apple and Android? $10 says you are merely a simpleton fanboy. Right? ios is a way more powerful os than blackberry. /: hopefully blackberry 5.2 err i mean 7 can change that. I cant wait to have a touch/full QWERTY did the andriod didnt like it so much even with a full QWERTY…i am just a berry girl! I miss my BB 8900 – amazing camera on that thing! Messaging was great as well. Only thing I do not miss is the 10 min start time should I have to reset the device. Why does it take so long to boot up? Have they addressed this with OS6? hell yeah… this phone is going to be sick….best phone ever rim os > all. undeniable. As much as I like my G2 I miss Blackberry. There are features that Blackberries have that Androids don’t. With a blackberry you can actually set the alarm and then turn the phone off. When its time for the alarm to go off the phone will power back on…I loved that feature. :) BBs have a great battery life, push email, great pictures quality, amazing keyboard, and I like how you could create files for all your photos within the photo gallery…you don’t have to download a separate app to do that. I can’t wait for this phone to be released. I MIGHT GO BACK TO BLACKBERRY AS LONG AS HE WONT REBOOT OR CRASH ON ME.